The hedgehog (Erinaceus europaeus) is one of Britain and Ireland’s most loved and charismatic species, a friendly visitor, found in both urban gardens and rural settings alike. Hedgehogs are protected under the wildlife NI 1985 (Schedule 6 and 7), which is further enhanced by the Wildlife and Natural Environment (NI) Act 2011 and is one of the priority species in Northern Ireland. Unfortunately, studies have shown that the species has declined significantly in the UK and Ireland in recent years. Here at CEDaR we want to help the hedgehog and find out what is happening to our hedgehogs in Northern Ireland. 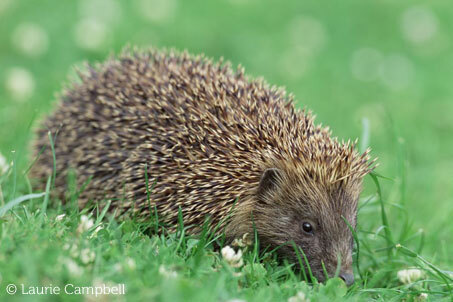 When was the last time you saw a hedgehog in your garden or around Northern Ireland? This information is vital to our understanding of the status of hedgehogs in Northern Ireland. Consequently we are asking you, as a member of the public to become a citizen scientist and submit any sightings of hedgehogs to our online recording system (including road kill). This will help to improve our understanding of hedgehogs and establish if there is a decline in Northern Ireland. The hedgehog has a short, rounded-looking body that is almost completely covered by a coat of about seven thousand dark-brown spines with lighter coloured tips. These are about 2cm in length and can be raised in defence. The head and underside are covered with coarse greyish hairs. The eyes and ears of the hedgehog are very small. It has a pointed and relatively mobile snout. The head and body length of a fully grown adult is about 250mm. Body weight can vary a great deal and is on average about 1kg. The hedgehog is able to roll up into a ball that protects its head, legs and soft underside. Hedgehogs are almost entirely nocturnal but are frequently seen at dawn and dusk. Nests are usually only built for the purposes of hibernation in winter and for rearing their young in summer. Outside of this the animals usually shelter in vegetation. Hibernation begins around October/November and ends during April. Please provide as much information as possible about your Hedgehog sighting(s).